LC Miller Company - Coil Mate quick-changeminiature coils for induction heating operations. The L.C. Miller Company has added a torque-controlled knob to its quick-change coil devices, known by their registered trade names of Re-Coil® and Coil-Mate®. These patented devices are attached to an induction machine, which allows induction coils to be changed in seconds. Changing coils without the quick-change device entails shutting off the water flow and removing the coil with an adjustable end wrench. This is a time consuming and costly process, which is completely eliminated by using the Re-Coil® or Coil- Mate® units. The development of the torque-controlled knob further enhances the utility of this product by insuring that the contact pressures on the coil terminals is always the same. Prior to the development of the torque-controlled knob a field study indicated that, in many cases, the system operators would over-tighten the knob and in some cases not tighten it enough. The later condition is most deleterious as it could create a very high resistance contact that could lead to arcing and possible damage to the induction system. 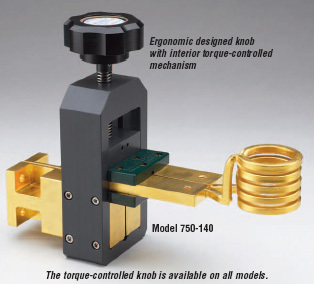 The torque-controlled knob obviates both of these conditions, as the contact pressure developed is always the same, regardless of the operator. The most desirable pressure is preset at the factory and cannot be changed by the operators. In actual operation, as the knob is tightened it will "slip" when the proper pressure is reached. This pressure is reproducible, which will provide long, trouble-free operation. The other condition to be satisfied for the efficient operation of the Re-Coil® is cleanliness. Dirty and oxidized coil terminals will reduce the efficiency of the system. To eliminate this problem we have developed a unique cleaning solution called Miller-BriteT. This is an advanced, low acid, water based solution, without harmful abrasives, that will develop longlasting bright and clean contact surfaces. The use of the torque-controlled Re-Coils®, together with the Miller-BriteT solution will provide a simple preventative maintenance regimen that will minimize down-time and costly repairs. Both of these products are available from stock.